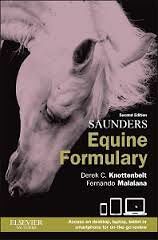 A handy and portable guide to today's leading equine drugs,Saunders Equine Formulary, 2nd Edition makes it quick and easy to look up drug information when you need it most - while you re in the field. And it's more than a simple formulary: this book also provides benchmark values on vital signs and normal values so that you can correctly interpret diagnostic tests. This new edition is the only equine formulary available both in print and as an app for mobile use. Written by a world-renowned expert on equine medicine, Derek Knottenbelt, this book is an indispensable reference for equine veterinary practitioners, veterinary students, and others involved in breeding and keeping horses.